More than 140 visiting vehicles will converge on Beamish Museum for the incredibly popular four-day Great North Steam Fair. See an amazing array of pre-1930 steam and motor transport – from locomotives, traction engines and steam rollers to fire engines, cars and motorbikes – in action across the museum. Catch a ride on Manchester Tram 765, courtesy of Heaton Park Tramway. The tram was one of a third series of combination cars built for routes with low bridges. Blackpool & Fleetwood ‘Box’ 40 from Crich Tramway Village/National Tramway Museum will also be transporting visitors around the museum. So-called for its box-like appearance, “Box 40” is one of the oldest operational electric tramcars in the national collection. In The 1900s Pit Village, visitors will also be able to take a short train ride hauled by River Irt, from the Ravenglass and Eskdale Railway, and Katie, courtesy of Ravenglass Railway Museum. These will be the first 15-inch gauge locomotives to operate at the museum. There will be the chance to see a 1906 Morriss steam car – the sole survivor of only four Morriss steam cars ever built. The company was based in London and is not to be confused with the more famous Morris (spelled with one S) Motors of Oxford. In The 1900s Colliery Yard, Steam locomotives Lewin and Coffee Pot will be running, plus see Simplex and Samson on the narrow gauge railway. Steam locomotive Peckett 2000 will also be running passenger rides at Rowley Station. Puffing Billy will take visitors on a trip through the Georgian landscape at the Waggonway. 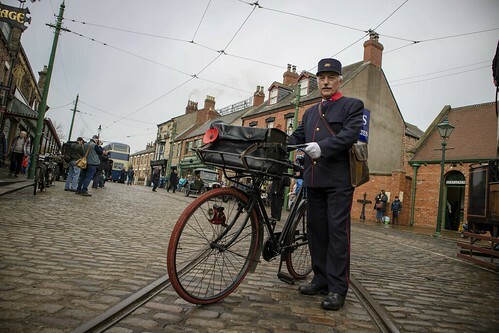 The Friends of Beamish will be in the school yard in The 1900s Pit Village with a fascinating display of vintage and veteran motor vehicles and bicycles. See the Durham Pals, Gordon Highlanders and Scots at War military re-enactment groups around the museum. Visit a Model Tramway Exhibition in the Collections Study Room at the Regional Resource Centre on Saturday, 13th & Sunday, 14th April. Enjoy a range of model tram layouts, including a model of Beamish. Two trade stands will be selling model tram kits and accessories. The Great North Steam Fair is the first event of our Great North Festival of Transport which also includes Horses at Work.